Using data visualisation tools to provide local context for decision making and meet open data aspirations – Open Data Aha! The Cambridgeshire Research Group has created several interactive atlases combining local and national open data with a range of InstantAtlas data visualisation analysis tools. It has been working to establish a local data portal called Cambridgeshire Insight Open Data as the single place to get local information. Organisations are now sharing data in order to change the way people live and work in the county, as well as meeting the requirements for an open government. 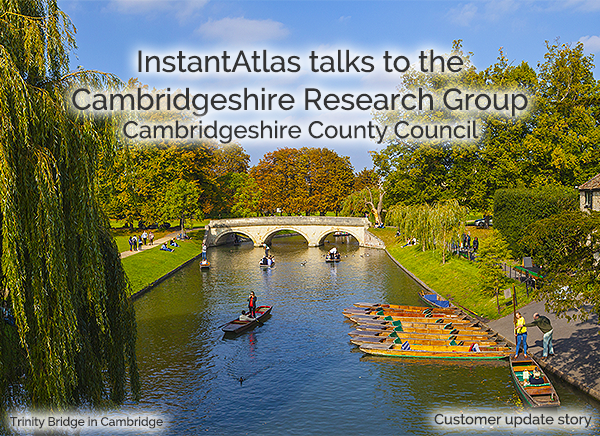 Using the latest developments in InstantAtlas visualisation tools Cambridgeshire Research Group is using Cambridgeshire Insight to meet the open government aspirations. We spoke to Hendrik Grothuis, Research Manager-Innovation, Cambridgeshire Research Group, Cambridgeshire County Council about the project. Could you tell us more about the latest additions?